A few years ago, I had a couple of employees who would regularly come into my office, telling me that we needed to automate a process. Being the typical visionary entrepreneur that I am, I was excited by the idea. The truth is that I loved these employees for about three months, until I realized that their desire to automate everything was actually causing nothing to get done and that their desire to simplify everything was wreaking chaos into the business. The siren song of automation is powerful, but as my experience supports, it’s extraordinarily difficult to execute. A core part of our Demand Cultivator Program is marketing automation, so we’ve gotten used to dealing with the challenges, opportunities and pitfalls of automation on a daily basis. Over that time, we’ve learned a little bit about how to make automation work, and, more importantly, when you should and should not attempt to automate something. Automation, done properly, is a tremendous multiplier. Gratuitous automation, however, is deadly. Automation is the last step. Automating anything is a design function. Design starts with an exploration of mysteries and one-offs. Everything is different, every time. However, you eventually gain enough knowledge and ability to develop common outcomes and themes based on these things that used to seem like mysteries. We refer to such themes as “heuristics,” which are basically sets of rules that you’ve identified to generally be true. 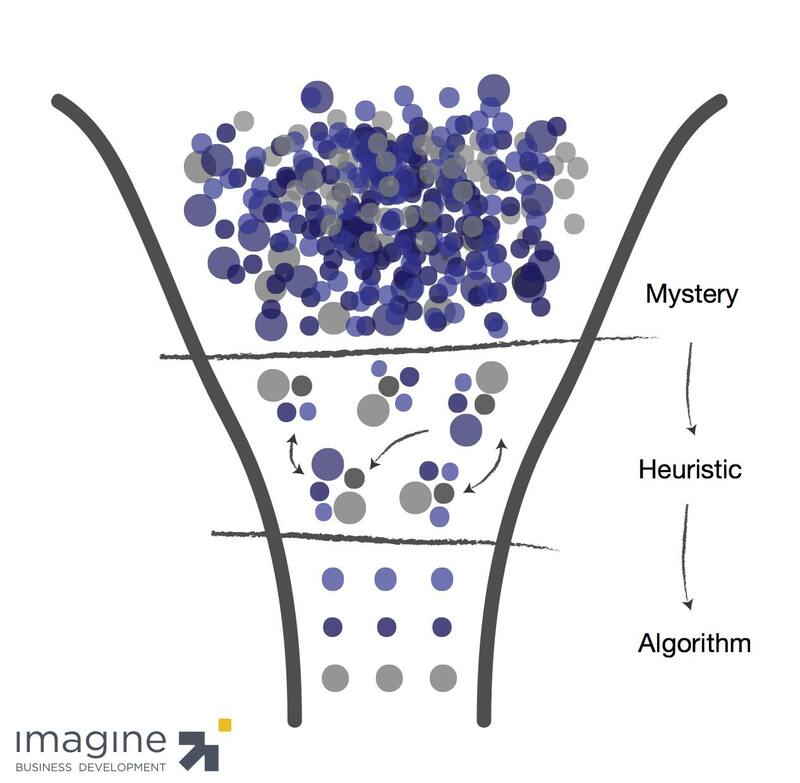 Heuristics are crucial to learning and growth. You can't scale anything when it’s different every time. Effective sales systems are built on heuristics. Heuristics, however, are not something that can be fully automated. To fully automate, algorithms need to appear. Algorithms are true every time. Algorithms are the last step in a design phase, and only apply to a portion of what you are working on. The biggest mistake made in automation efforts is the attempt to automate heuristics. This is the primary cause for failure. Automation doesn’t work without clarity. The heuristic level can be a frustrating place to be. Our minds easily confuse the idea of, “I know this to be true most of the time,” to simply, “I know this to be true.” It simplifies things for us. The problem is that the moment you attempt to automate, every deviation pops up and you’re left feeling like everything is back to being a mystery. What’s important to know is that 80% of the value process development is created in this arena. While it’s frustrating, it’s critical to build a sustainable, scalable growth platform. Automation relies on a solid process. I’m amazed how little process exists for most companies in their sales and marketing realm. Every sale, every outreach is handled differently. We get brought into these situations to create predictability and efficiency, while also enhancing the effectiveness of growth efforts. While the idea of automation is exciting, the actual painstaking process of creating an effective process isn’t all that enjoyable. I often say that simplicity lies on the other side of complexity. This is true with process development efforts. You must uncover all of the complexity and chaos to develop an effective process. And, you must have an effective process before you can automate. You can’t automate what you don’t understand. I think the reason automation is so endearing to executives lies in the myth that they can “set it and forget it.” Successful automation requires deep, deep knowledge. You cannot effectively implement marketing automation without deeply understand who your customers really are, and without clearly defining your buyer personas. Sometimes the best, most efficient thing you can do is don’t automate. Automation is not always the best solution. I remember when I first started using HubSpot as the central tool for our marketing automation and lead cultivation efforts. I wanted to automate everything. Put everyone into a segmented campaign. Set up lead scoring to tell me when I should start the sales process. I learned that the volume of opportunities I was managing wasn’t conducive to automating the entire process. I realized that there was still enough difference from one opportunity to the next, and that certain judgments had to be made in order to effectively manage the process. This realization led to us changing our approach. Early in my business career, someone told me about The Four Seasons service philosophy. Their philosophy is to “automate the predictable, so you can humanize the unpredictable.” Today I embrace that philosophy as the prime directive. We now look at our processes and determine which parts of them are predictable and which parts aren’t. We then work to automate only the predictable parts, and our process becomes far more manageable and effective; and our business has become far more predictable. One more point about automation: It’s not perfect. You can’t set it and forget it. You need to consistently assess and tweak it as conditions change. Make sure you build flexibility into your process to gain the traction you desire.